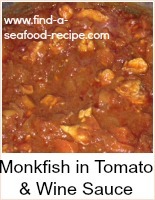 Although I state plaice in this crab stuffed fish recipe, you could of course use any flat fish. Dabs or sole for instance. The general guidelines for stuffing and rolling fish apply to any flat fish. 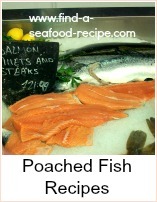 You need to score the skin side two or three times, depending on the size of the fillet. When you come to spread the stuffing - put it on the skin side - that's even if you've removed the skin - you then roll the fillet around the stuffing. If you roll them this way, then the fish will keep its shape - if you roll them skin side out, during cooking, the roll will contract and open - the stuffing will fall out and the dish won't look so good. Take the stuffing ingredients and whizz them together in a food processor. You can mix by hand which will result in a coarser texture, but I prefer a smooth mousse. Set aside in the fridge for about an hour. Spread the mousse on the skin side of each prepared fillet and roll up tightly. Put the fillets in a pan just big enough to take them - pour over the stock. Bring the liquid up to simmering point and then cover the pan. Cook for about 10 to 12 minutes. Keep the plaice rolls warm whilst you reduce the stock a little and then stir in the cream. Sprinkle a little paprika over the fillets for color. Serve the rolls with a little sauce poured over. 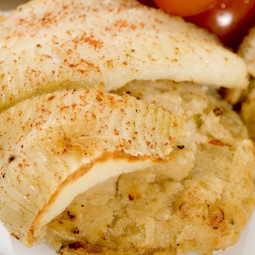 Some boiled, buttered vegetables and potatoes would go well with this crab stuffed fish recipe. It doesn't need any 'dressing up' it's quite fancy itself! 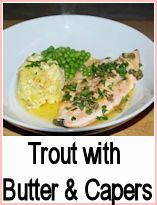 This recipe will serve 4 - either use four large fillets and cut them in half lengthways or 8 small fillets - the portion is two rolls each. The crab can be canned, frozen or fresh. I like to use a mixture of brown and white, but it's up to you. A lot of people would use only white, but I feel that the stronger flavour comes from brown and so I like to mix them. It's largely a matter of appearance and entirely up to you. 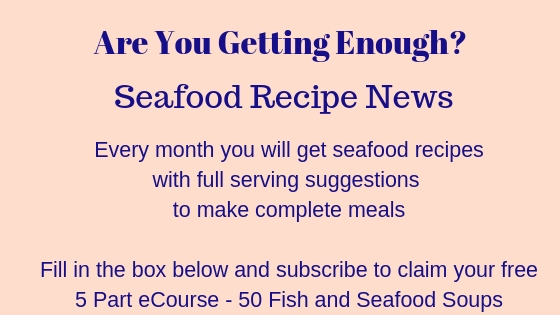 If you need a recipe for fish stock - click this link - it will take you to another page on my site and a new window will open. A very fine plaice stuffed with a crab mousse. Rich tasting and luxurious. The mousse is simple to make and the stuffed plaice will take around 12 minutes to cook.